OKTA L.A. members are reviewing the products manufactured by hardware developers Trimmers. The Korea Daily has partnered with the Overseas Korean Traders Association L.A. (OKTA L.A.) to travel to Vietnam to report on the market in Vietnam as well as its manufacturing factories. Along with OKTA L.A.’s 20-odd members, the Korea Daily is currently on a six-night stay in Ho Chi Minh City and Hanoi to learn more about the Southeast Asian country’s market. After visiting KOTRA Vietnam on Oct. 24, OKTA L.A. was able to learn about the current status of the economy in the country. South Korea, in particular, is making more investments in Vietnam than any other country by far. Last year alone, $48.5 billion was invested in Vietnam from South Korean companies. The Americans have also invested $10 billion. More than half of the total investments have been made in manufacturing businesses. 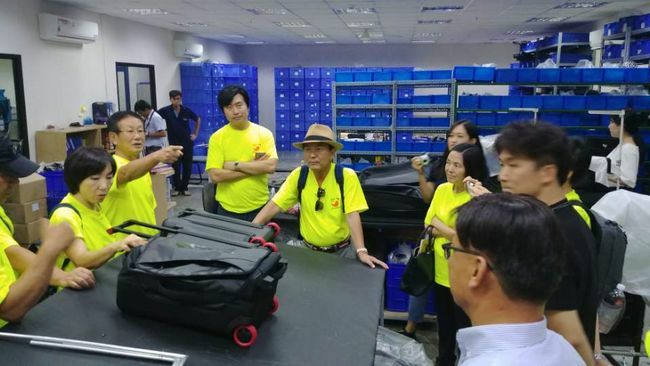 The OKTA L.A. members also visited a luggage manufacturing company Trimmers, a company operated by OKTA Vietnam members. The OKTA L.A. members expressed interest in the Vietnamese market.